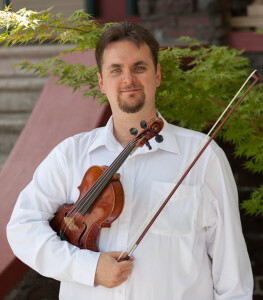 Dan Flanagan currently serves as Concertmaster of the Sacramento Philharmonic and Opera, the Modesto Symphony, Lecturer of Violin at University of California, Davis, and Instructor of Violin at University of California, Berkeley. Described as a “stellar musician” (Nevada Reviews), he has been praised for his “exquisite tone” and “forthright brio” (Sacramento Bee). Born in New Jersey and trained in New York and Michigan, he holds a Bachelor’s Degree from the Cleveland Institute of Music and a Master’s Degree from the University of Oregon, where he was a Graduate Teaching Fellow. His teachers include Linda Cerone, Charles Castleman and Fritz Gearhart. Flanagan plays on the violin made by JB Vuillaume, once owned by the celebrated American virtuoso Albert Spalding.